• Charging iPhone or USB-C devices requires a Lightning or USB-C cable (not included). Fast Charging Technology: PowerIQ and VoltageBoost combine to provide the fastest possible charge up to 2.4 amps per port (Does not support Nexus 5X and 6P or Qualcomm Quick Charge). Certified Safe: MultiProtect safety system ensures complete protection for you and your device. 12 / 24 volt input voltage. 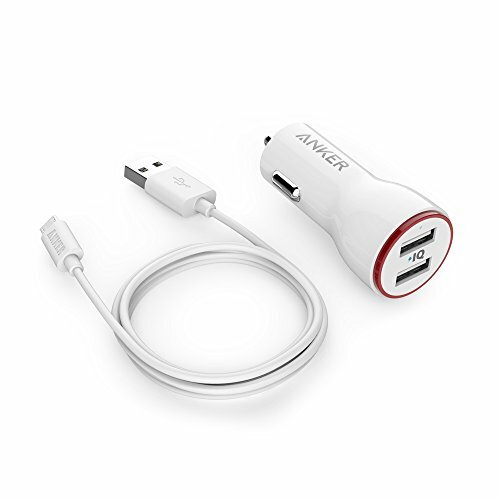 Compact Design: One of the industry's smallest ever USB car chargers, featuring two USB ports and an LED light for after dark. Micro USB connector fits into virtually all case cutouts, big or small. What You Get: The Anker PowerDrive 2 + 3ft Micro USB to USB Cable Combo, welcome guide, our fan-favorite 18-month warranty and friendly customer service.